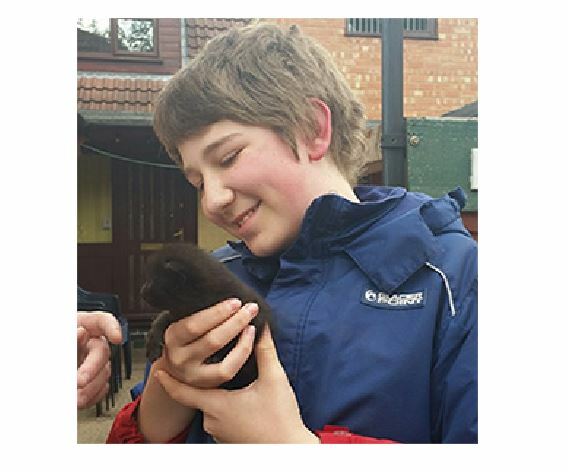 James Frearson, aged 13, grabbed a torch light and got stuck into helping RSPCA UK Inspector Sarah Burrows free the three kittens and their mum, who was a stray. 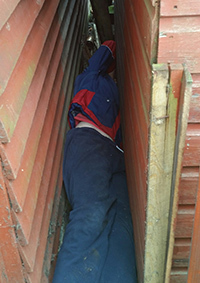 The rescue operation took 90 minutes, with James squeezing himself into a tight gap of around 12 inches between two sheds in a bid to help the cats. Inspector Burrows arrived at the house in Station Road, Long Eaton, Derbyshire, UK at 2.40pm on Monday (July 27) after James’s mum, Hayley Frearson, saw a kitten poke his head out from under the shed and called the local Derby branch of the RSPCA. When Inspector Burrows struggled to reach the cats, Long Eaton School pupil James decided to help her. “We didn’t know how many kittens were under there at first because it was hard to see. Once James got hold of the first one, he was really happy and was proud of himself, as he should have been because it wasn’t easy. He was covered in spider webs and dirt but that didn’t stop him. “It was really hard because they were so small. I wasn’t worried about getting stuck but I was worried that I would hurt the kittens. Thankfully I didn’t. I do feel proud to have been able to have helped the kittens and their mum. The kittens, who are thought to be around two weeks’ old, and their mum are now being cared for at the RSPCA’s Abbey Street branch, in Derby city centre. One of the kittens has been called James after his rescuer, with the other two being named Ozzie and Eddie. The mum has been named Penelope.